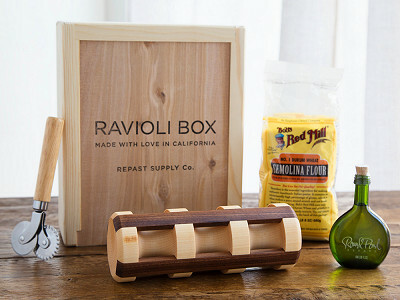 Making homemade ravioli can be intimidating, but it’s easier to master with Repast’s handcrafted rolling pin. Founder Michael Finizio is an engineer, woodworker, and foodie who loves bringing people together for a meal. (His company is named for the time during which a meal is eaten.) Michael wasn’t impressed with most ravioli rolling pins, so he created his own. Thoughtfully designed, this rolling pin is as much a piece of art as it is a kitchen tool. Repast believes in sustainable living, so each rolling pin is Made in the USA from hardwood. And for every tree they use, they plant 100 more. It won’t do everything for you, though—you’ll still need to make your own pasta sheets and filling. Spread filling across two thirds of one pasta sheet, then top with another. As you press the rolling pin firmly across the sheet, you’ll feel like a pasta master, watching deliciously plump ravioli form beneath your hands. Hello Grommet Community! I'm Michael Finizio, founder of California based Repast Supply Co. I'm an avid cook, engineer and woodworker but above all I just love bringing people together around the table. I'm happy to answer any questions you have about our sustainable pasta tools! As a little,girl, I remember my Grandmother making ravioli. She used a thin, very long rolling pin. It was a huge undertaking but the family was definitely excited to have them. @Rosalie Hi Rosalie! I too have used the long thin ravioli pin and I have to admit, it can be more trouble than it's worth. I designed Fonde specifically to solve this problem: The ravioli it makes are properly sized, they're easy to cut and most importantly they stay sealed while cooking! This is so genius. But, do you have one that makes a larger ravioli? I know its all about portion but we are used to larger raviolis. @patricia Hi Francine. Currently this is the only size we offer, but I can assure you that when cooked, the finished ravioli are about 2.5" x 2.5", which in my opinion is quite substantial. doesn't the filling material go places other than the pouch? wouldn't that create a seal problem at the edges? @Joe I agree--I would think the all-important seal would be a problem. @Joe Hi Joe! Great question. The magic of the Fonde pin is that once the two layers of pasta come in contact, the pressure applied from your hands fuses the two layers into one. Fun Fact, Fonde is Italian for "to merge or fuse together." Hi there, Grommet CEO here. We're so happy to support Michael and his gorgeous creation. I only wish that people discovering Repast here could have the experience of holding the tool. It is super heavy (in a good way) and so finely crafted/sanded/finished that I honestly would leave it out on a coffee table as a thing to just enjoy holding and as a conversation piece. Alternately, if you have display space in your kitchen, you would never put this in a drawer. @Jules Thanks so much for your support, Jules! The Grommet team has been a real pleasure to work with. 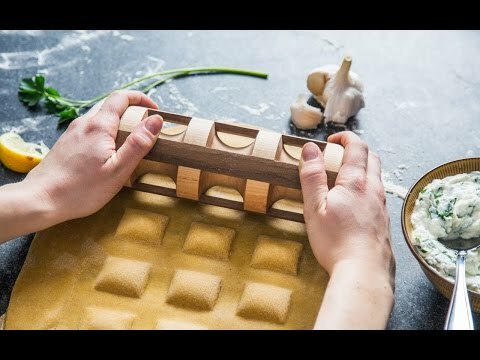 I didn't realize you could make Ravioli this way, it seems much easier than the pasta roller I debated buying for my mixer. I will definitely be buying one in the near future. I think it's a great idea, and seems WAY easier to clean than the roller. However, I'm a little confused by your business. The Grommet has this rolling pin listed at $79 from Repast Supply Co. a California based Company. Williams Sonoma, sells your rolling pin for $59 from Repast Supply Co. a woodshop in Minnesota. I mean, I don't care if you're in Minnesota or California, really makes no difference to me, but I will be saving my $20 and shopping at William Sonoma. I wish you luck however. Do you do the decorative rolling pins for cookies as well? Like the ones that stamp pictures into the cookie dough? I'm on the market for one of those as well for sugar cookies. @Cheyenne Hi Cheyenne! Thanks so much for this feedback. Williams-Sonoma is offering different versions of our product at a discount, but the specific model being sold by The Grommet (Maple with Walnut accent) is more expensive at Williams-Sonoma ($95 & $120). Repast Supply Co. is based in California, and we manufacture all products in California, however in the past we've used a Minnesota based manufacturer. I hope that clarifies things for you, please let me know if I can be of any more help! However, Maple with Cherry accent is currently on sale for $44.99 – $59.99, which is about half the price. Then I guess it comes down to personal preference, Jim. Once again the price a 'new' product is under discussion and once again I feel that the prices on Grommet are way too high. Who cares if the rolling pin looks like a work of art, I just want to roll out the pastry, after which it will go in a drawer and not be seen until it is needed again. @alastair Don't complain. Just buy it elsewhere if the prices are unjustified. Gregory, that's one way of putting it. Alastair, a lot of people care that it looks like a work of art. If you don't, that's ok, we knew it wasn't going to be for everyone, but that isn't going to stop us from highlighting this innovation and craft. Our prices, as I have told you before, are the price of the product. We are not hiking them, but more importantly, we are not slashing them like other sites. Such a practice would directly contradict our mission to help Makers succeed. I was just researching online and found a few that are similar to your product for a drastic decrease in purchase. I also found another product which is made of plastic but is a 2 in 1 at a rate of $25.00. The other is considerably less than you have yours for. I think the value you put on it is way too expensive for the home cook. Hi Delphina, if you can find me a similar product that is handcrafted, made in America of American wood, AND looks as good as Repast does, then I'll be impressed. This is basically a handcrafted art piece that also makes ravioli. @Mike Hi Delphina, I should also add that no other ravioli-making product on the market does as good a job of sealing the ravioli. Similar products are not only made in China from unsustainable woods, but they create ravioli that easily burst while cooking. @Michael What a wonderful product! My dear mother in law made home made ravioli. They just melted in your mouth. Unfortunately I never learned to make them before she passed. This looks so easy! Can't wait to get this home and start up an old tradition with my boys! That sounds like a great plan, Shirley. Thanks for sharing. I hope you enjoy! This isn't a new idea, and $79? What' makes this better than a $21 one from Jet? Hi Christopher, that one is not American wood and doesn't appear to be handcrafted or made in America. Also, Repast looks to be a lot more durable. 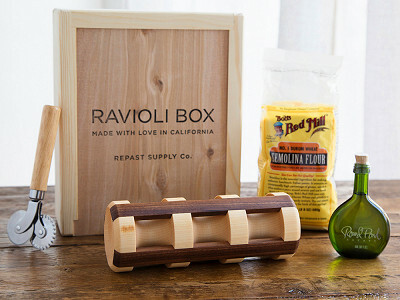 Not that you would ever sword fight with ravioli rollers, but if you did, I would use Repast. @christopher Hi Christopher, thanks for the great question. Norpro's version makes very small (1" x 1") ravioli that do not stay sealed in water. Their's was the first ravioli pin I bought, and it was $21 I wish I'd never spent. Your $79 is not only purchasing a functional piece of art that's made in the USA but is helping to replant trees. Repast Supply Co. plants 100 trees for every tree used in production through a partnership with Arbor Day Foundation. To date we've planted 1500 trees. Like the ravioli rollers he creates, Michael supplies a a response far more artful. I'm an avid Grommet shopper AND Fonde user....so happy to see this product listed here! I can attest to the beauty and durability of these pieces...they work so well that even my 8 year old daughter can make her own ravioli! @mia Thank you so much, Mia! I just wanted to offer this to the artist who created this wonderful device, it is eloquent in more ways than one. Not only is the fine craftsmanship instanly evident, but the function works almost as if by magic. That is the mark of a truly creative and innovative product. It's job is certainly something that many have duplicated but none with quite the panache. The plastic foreign garbage is just that, recycled garbage dumped onto an American market where it finds itself in the hands of less informed and unfortunately cheap (it was the kindest word I could find to use here) people. Thank you for putting for the effort to allow the traditional of American craftsmanship to shine through your product. I applaud you on not only producing it in America, but also in your choice of using American woods in it's creation. It is the most beautiful, as well as beautifully ingenius kitchen tool I've found to date. I will be sharing your story and product with everyone I know. I can think of a couple whom I know will become customers right away. Thank you for placing one more glimmer of hope into what I imagine to be a new American economy and manufacturing dynamic that I hope catches fire across this entire country. It was not so long ago that our grandparents made nearly everything they used, or it was purcbased from someone else they knew personally who had the talent for building tbat thing they needed. Self reliance, and the American small business economy is what will sustain us, as it has before, through the rough times in our national economy... And I believe that if we relied on it more regulary today, we could solve our economic problems for ourselves without the "help" provided by a government (parties irrelevant) that has created an environment wherein the American creaftsman and his employees are almost a dying breed. Only those sorts of people, people like yourselves, refuse to go quietly into that good night. For that I applaud you. @Ryan Ryan, thank you so much. This is the most meaningful piece of feedback I have ever received from a customer. I'm so happy that you feel as strongly about the value of American made products as I do. Ryan, I applaud YOU. You get it. Makers, Citizen Commerce, the Maker Movement, you nailed it all right there. This may be the most beautiful thing I've ever read on a launch conversation. Thank you. And yes, everyone, I'm fine. I just have a thing in my eye or something. Don't worry about it. This is a beautiful product! 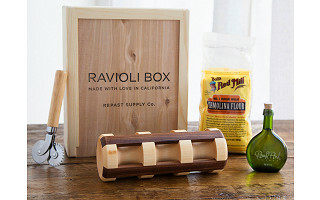 I'm buying one for my son who is a great cook and ravioli is one of his specialities. I was wondering if you include any information in the package about how it's made, why it's special and how best to use and care for it. Thanks. @Janet Hi Janet! Thanks so much for your purchase. Yes, attached to every rolling pin is our product tag which includes care and use instructions, as well as a link to our website with instructional videos. Thank you for making a product that simplifies the method I used from watching my mother make homemade ravioli. Nothing tastes better than fresh made pasta. @maria rose You're welcome, and I couldn't agree more! 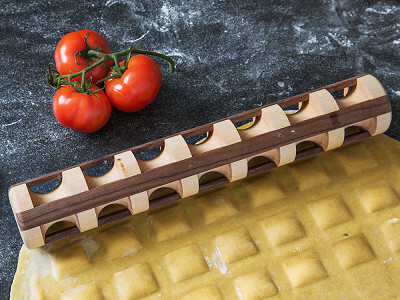 From a engineering point of view, this is a very elegant a nice solution for anyone who enjoys homemade pasta. Like a earlier commenter, I really like that its made in the USA and from native American hardwoods. I work for a paper company myself and totally understand the sustainability aspect of this. I love ravioli, but it always has seemed just too hard to do at home. I am looking forward to getting one of your rollers and start trying my hand at this. Thanks for you stance on making this in America and supporting that. Good Luck! @Ken Hey Ken, thanks so much for the great comment. In a recent ravioli class I taught at Zucchini & Vine in Chico, CA a customer exclaimed "Wow! If I'd know it was this easy to make ravioli, I would do it all the time!" Bingo... A big part of my mission is showing people that you don't need to be a gourmet cook to make gourmet ravioli. Two years ago I had never made pasta, I literally learned from watching a couple YouTube videos. @Michael Hi, from what I see in the video, there appears to be a lot of waste around the edges and quite messy. Hi Phyllis, it will depend on how much pasta you've made. You can always curtail the quantity to limit excess.